A research team from the School of Chemistry and Chemical Engineering at Hunan University of Science and Technology has suggested a new approach for producing non-precious metal catalysts in zinc-air batteries without affecting its stability, electroactivity, and affordability. The study results will be published in the forthcoming issue in NANO. Zinc-air battery, being a green and sustainable energy generator, has attracted a considerable amount of interest from scientists because of its high current density, high specific energy, environmental friendliness, and low cost. However, the zinc-air battery also has certain inherent disadvantages. For instance, its commercial application is largely limited by its cathode’s slow oxygen reduction reaction (ORR). One potential way to overcome this problem is to utilize platinum (Pt) as well as Pt-based catalysts; however, this approach is not ideal because of the high cost and limited availability of this metal. Moreover, alkaline NaOH (or KOH) is often utilized as the electrolyte, but it results in the formation of carbonates (CO32-); this is because CO2 tends to dissolve in the electrolyte and the anodic zinc also corrodes spontaneously in strong alkaline media. As a result, the electrolyte’s ionic conductivity and battery life are slowed down. Hence, it is better to use a neutral electrolyte. In order to supplement this, a metal ORR catalyst that is non-precious and can also function in a neutral electrolyte has to be identified. A research team from the School of Chemistry and Chemical Engineering at Hunan University of Science and Technology has proposed a new method for synthesizing non-precious metal catalysts with excellent electroactivity for ORR in neutral electrolyte. 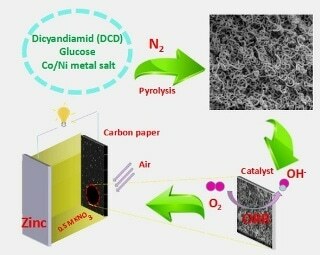 Through a facile pyrolysis of glucose, Ni/Co salt, and dicyandiamide, the researchers prepared Ni/Co-doped C-N hollow nanotube composite catalysts (Ni/C-N, Ni-Co/C-N, C-N, and Co/C-N). Then, utilizing the prepared sample as the catalyst of the air electrode, exhibiting excellent stability and discharge performance, a corresponding zinc-air battery was arranged in a neutral medium. A curly tubular structure was displayed by the as-synthesized Ni/Co-doped C-N composites leading to remarkable stability and active surface area. A neutral zinc-air battery using a 0.5 mol·L-1 KNO3 solution was assembled by utilizing Zn plate as an anode as well as the prepared composite catalyst coated on carbon paper as an air cathode. The open circuit voltage of 1.13 V and the highest power density of 65 mW·cm-2 are delivered by the battery equipped with the cathode catalyst Ni-Co/C-N. In addition, the continuous discharge current density of 50, 100, and 150 mA·cm-2 can last 202, 93 and 11 hours, respectively. At numerous discharge current densities, a stable voltage plateau materializes. After the zinc anode is replaced, the neutral zinc-air battery can be repeatedly discharged, demonstrating the cathodic catalyst’s high stability and wide application possibilities as a mobile power source. The National Natural Science Foundation of China (21875062) supported the study. Qingfeng Yi is the corresponding author of the study.